PLEASANT HILL, California -- A California man says he was offended by an employee at a Staples store who appeared in blackface as a Halloween costume intended to represent a Sharpie marker. Harrold Leffall stopped by the Staples in Pleasant Hill Friday to purchase a cash register. When he questioned an employee about the registers, he was shocked to see her face covered in black paint. "I said, 'ma'am, where are the cash registers?' Then she turned around and I saw this white lady in blackface and I kind of froze," Leffall said. He then questioned another store employee about it. "I said the lady over there is in blackface, and as a black man I am very offended and I think that's very inappropriate." He says the other employee replied, "she said it was a sharpie costume, and I said sharpie or no sharpie as a black man to see a white person in black face is very offensive." Blackface is a form of theatrical makeup used by white performers to portray black people in the 1800s up until the civil rights movement. "The nervous giggle in the store I felt like it was making fun of African-Americans," said Leffall. He left the Staples frustrated and sat in his car for a few minutes. But he couldn't leave. He went back in the store to speak to the manager. He questioned the manager about it who then told him, "I know what happened, and they have already told me," Leffall then replied, "What made you think that was OK?" The public relations staff for Staples and Hewlett-Packard says the employee in the photograph works for a third-party company called Marketsource which contracts for HP at some retail stores. 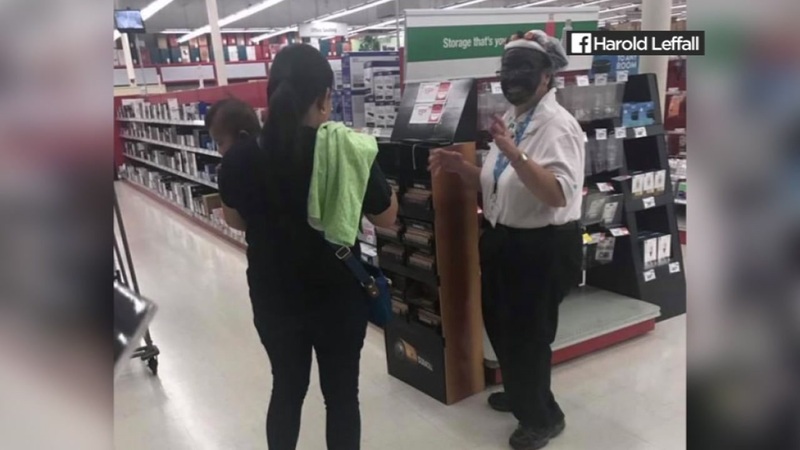 A new video has surfaced of a worker in a Staples store wearing blackface that's gone viral after an ABC7 News report this past weekend. "A representative from HP who was in one of our stores wore a costume for Halloween that they intended to have represent an office product, but didn't realize it could be considered offensive to some of our customers. While it was unintentional, it was still inappropriate and once this was raised to the representative, they immediately removed the costume." "Staples apologizes to any customers that may have viewed a photo of the associate on social media. We respect diversity and try to foster a sense of diversity and inclusion in our stores, as well as provide an atmosphere in which all customers feel comfortable." Leffall says he's not buying that apology. He also doesn't plan to shop there anymore. "A company that doesn't have a level of sensitivity to a struggle of a people that is a large part of their customer base is not a company that I am going to support," said Leffall. The woman is no longer working at that store. Her company's human resources team is investigating.